Create interactive dashboards that support real-time decisions. 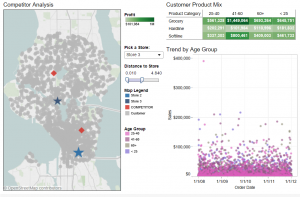 Incorporate geographical-based data for targeted segmentation. Blend multiple data sources for more robust analysis. Industry trends at your fingertips Retail is highly volatile business, particularly during economic recessions. This makes tracking industry trends all the more important to both large and small retailers. No matter what product segments you operate in, you probably have questions about your industry. How are things going overall? Are we out of the recession yet? What time of the year do people like to shop? How is my product segment doing? Do some product segments perform better than others? This dashboard blends data from three different spreadsheets and let you answer these questions in minutes. 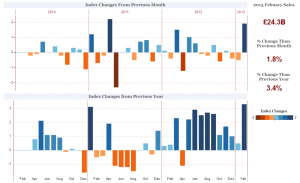 The two bar charts give you an overview of index changes from previous months and year, while the right side panel offers you the actual sales and percentage changes in the most recent month. Best of all, selecting product category in the filter window lets you see index changes in that particular product segment. As you can see when you explore this visualization, all retail segments (excluding automotive fuel) have had great year-over-year growth in the past three years, even though seasonality remains strong. The categories non-store retailing and non-specialized non-food stores have been doing particularly well throughout the recession while most other segments had periods of struggle. Understand your local customers What do customers at Store #283 really want? It’s likely to be at least slightly different than those heading to Store #59. Use all the information you have about customers to make informed decisions about your product mix. Urban sites probably sell more small items than suburban stores where customers can fill their trunks with bulky things. And stores catering to an elderly population should carry a different selection than those with a high number of twenty-somethings to optimize customer satisfaction – and sales. Click into this visualization and explore who’s who in a store’s neighborhood. Do they buy more hard goods or soft? Is there an age concentration that informs what should be stocked? Does the mix vary as you move towards or away from competitive stores? Make inventory decisions with more insight Inventory is often the retail KPI that determines success. Getting the balance just right – not too much, not too little – is retail nirvana. How do you create this crystal ball? It relies on aggregating the right data and then visualizing it in a way that lets you make informed decisions. This visualization offers one way that inventory, shipping, pricing, and sales data can be viewed in one place, driving better pricing and purchasing decisions. What’s the current view on our over/under inventory by product? What happens if we raise – or lower prices. Select the dashboard adjust the price to see how your favorite beverage would perform in different scenarios. Place products where they sell best Back of the store - or the front? A store’s layout drives competitive differentiation and sales. So how can you determine the best approach? Use data to turn layout decisions from art to science. 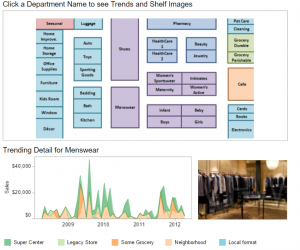 Retailers are redefining how they prioritize product placement by visualizing their data. By aggregating data about how products perform in a single view, merchandisers can make informed decisions for to boost a store’s sales, which products to promote, and how decisions should vary by store format. Select a department in the planogram to the right. The image provides a view of the shelf and lets you start asking and answering questions about the department's performance in various store formats. See how fast and easy it is to gain product placement insight Retail leaders understand that product placement is key. Maximizing selling potential for every square inch of aisle and shelf space is an absolute necessity. Tracking the effectiveness of these placements as products change and demographic tastes shift is equally important in order to retain customer interest. 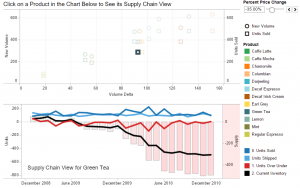 This video demonstrates how quickly Tableau can be used to build an interactive store planogram focused on providing rapid insight into buying trends by departments. Learn how easy it is to incorporate existing visual snapshots of shelving arrangements that tie into key operational metrics.